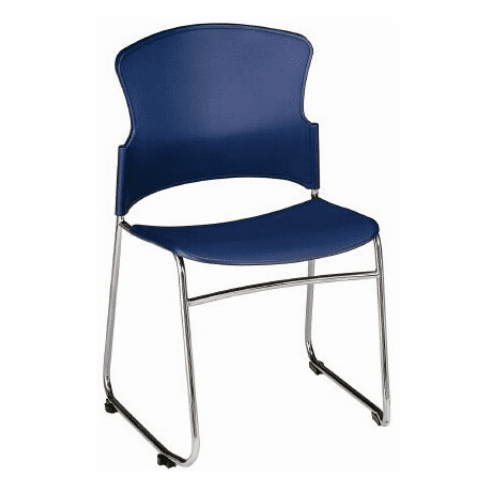 These durable multi-use stackable chairs from OFM feature your choice of solid molded plastic seat pans, or plastic seat pan with vinyl upholstered cushions. Other features include a contoured seating area with built in lumbar support, tubular steel frame with sled base, built in ganging brackets (allows chairs to be linked together) and a brilliant chrome plated frame finish. These chairs can be stacked up to (12) high. Meets or exceeds ANSI/BIFMA safety standards. Dimensions: Seat Size: 18.5"W x 17.5"D. Back Size: 17"W x 14.5"H. Seat Height: 18.5"H. Overall: 33"H x 21"W x 22"D. Limited lifetime warranty from OFM. This chair normally ships within 1-2 business days from our NC or AZ warehouse. *Ships by tractor trailer due to the size. Customer will need to unload the chair from the tailgate of the truck. Inside delivery is available as an option.